The Roman Catholic Church has said it is in a "catch-22 situation" over the A-listed St Peter's Seminary in Scotland, as it can't sell, demolish or give away the brutalist ruin designed by Gillespie, Kidd and Coia. The Archdiocese of Glasgow told BBC Scotland the brutalist building, once hailed as a masterpiece, will remain a ruin unless it gets public funding. A spokesperson said the Church has been unable to sell, give away or demolish the structure, which was granted A-listed status in 1992, following the renovation plans being shelved. "We are literally struck," Church spokesperson Ronnie Convery said. "We can't sell it, we can't give it away, we can't demolish it. We are in a catch-22 situation," he added. "We would literally give it away for nothing but we can't find anyone to take it off our hands." Glasgow-based arts organisation NVA used to own the structure, but a £10 million plan to turn it into a cultural centre fell through when the charity folded in the summer of 2018. Now the Archdiocese of Glasgow is once again responsible for the derelict building, but said it was in an "impossible position". "The archdiocese recognises that it has the responsibility to maintain the estate, to keep it secure and provide the proper insurance cover, but as you can imagine it is a huge albatross around our neck." An albatross strung around the neck is a metaphor alluding to Samuel Colridge's The Rime of the Ancient Mariner, where the dead bird acts as a symbol of a burden that feels like a supernatural curse. Architectural firm Gillespie, Kidd and Coia completed the priests training college in Cardross, near Dumbarton, in 1966. Scottish architects and Andy MacMillan and Isi Metzstein designed St Peter's Seminary's vaulted chapel ceilings and rough concrete form that owed a stylistic debt to Le Corbusier. But with the number of aspiring priests in decline it never reached its full capacity of 100 students and had closed by 1980. Since its completion the building has been plagued by maintenance issues related to its unique design, and problems with water ingress. 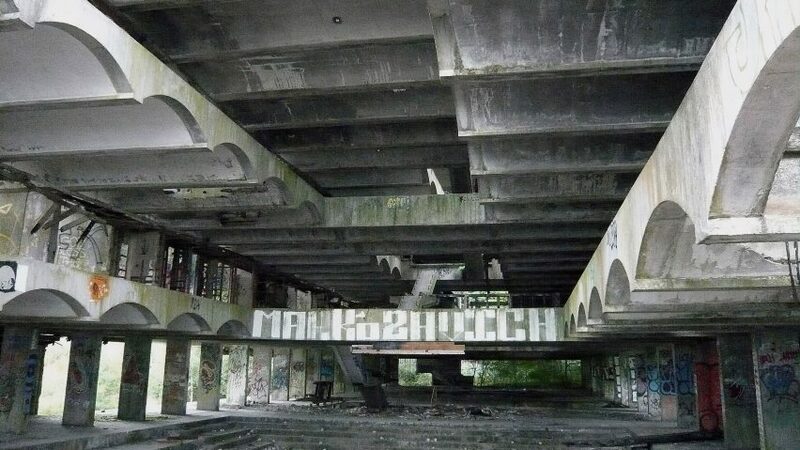 Public funded needed to save "concrete car park"
Convery said that St Peter's Seminary would probably need public funding to prevent it falling into further decay. "If someone were to go today through the forest and try to find this A-listed masterpiece they would probably be shocked because it looks to an average person, who does not have a lot of architectural background, a bit like a concrete car park that has fallen into ruin," said Convery. Any plan to rejuvenate the ruin will be hampered by the amount of damage that has been done to the building since it stopped being used Catherine Croft, director of the Twentieth Century Society told Dezeen. "The great tragedy here has been the lack of maintenance and security. Unchecked vandalism and lack of repairs has caused millions of pounds worth of damage, which any scheme to secure the site's future now has to deal with," said Croft. "It's a real object lesson on how important it is to secure buildings whilst their fate is decided. We very much hope that funding will be forthcoming to save this unique masterpiece." A spokesperson for the Scottish government said that the future of the building was in the hands of the Archdiocese of Glasgow. It's been a bad month for abandoned modernist landmarks, with discussions of blowing Berthold Lubetkin's Penguin Pool "to smithereens" making headlines last week. Photography, dating from 2010, is by Mad4Brutalism via Wikimedia Commons.